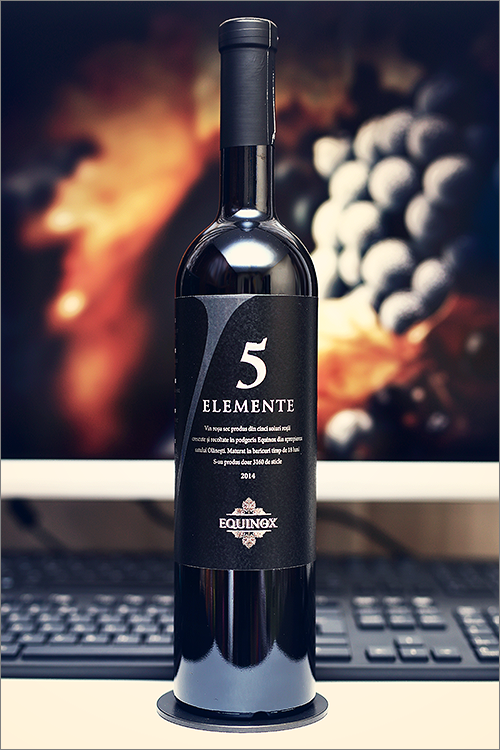 Tonight we are going to review a legendary wine blend that is made with no fewer than 5 grape varieties: merlot, syrah, carmenère, malbec and rara neagra – all of them combined to the point of excellence – 5 Elemente 2014 from Equinox. Each variety was harvested individually at its optimum ripeness and aged separately for 18 months in new oak barrels. Only afterwards, when each of these five reached their readiness points, the winemaker started the blending game, using the good old technique of trial and error. A few trial blends were made with different compositions and the best one was chosen to create the 2015 blend of this incredible wine. Needless to mention that it has been produced in a very limited edition of only 3160 bottles, thus the wine is a rarity even here in Moldova. But enough theory, let’s get straight to the tasting! Deep and noble garnet color, with some scarlet-indigo shades towards the rim of the glass. The nose is strong, filled mostly with ripe black fruits and jam: smoked plum, overripe sour cherry, black cherry, ripe blackberry, black mulberry, blackcurrant, mulberry jam, black raspberry jam, black cherry jam, blackcurrant jam and cherry seeds. An instant later the nose is filled with elegant notes of cherry tree wood, nutmeg, sweetwood, dried figs, tobacco, big leaf black tea, roasted oakwood, black pepper, dark chocolate, charcoal and some subtle hints of leather. The wine is extra-dry, with high alcohol level, high acidity and ripe tannin. It feels tannic, seedy and velvety, with a nuanced fruity-crisp accent. This is a quite elegant, expressive and complex wine, as it tastes ripe, firm and woody. The is a quite well balanced and structured wine that has a nice harmony between fruit and barrique. It has a long finish and an velvety, seedy-tart yet aftertaste. This is definitely a great Wine of Moldova and the overall rating says the same, with 92.6 points scored it is right there, among the best wines we’ve tasted so far. Please click on the chart icon on the left in order to get to the wine rating page, where you can find all the wines we’ve tasted to date. Conclusion: this is a wine on the rise that has yet to reach its top form, yet, we have to admit it – it is very close to the summit. We think that it will get there in about 2 to 3 years of bottle ageing in optimal conditions. Despite its youthfulness, it has a grippy tannic accent on the palate, a well textured mouthfeel and a very elegant finale, with some mouth-watering acidity, that make this wine nothing less than a bottled mixture of ripe fruit and noble wood. We would recommend to pair this wine with meaty and spicy dishes that are rich in irony-umami flavour with smooth textures, like for example a pan-seared filet mignon with red wine and balsamic sauce or some grilled pepper steak, in order to match all the wine’s elegance with the spiciness of the dish. Enjoy!